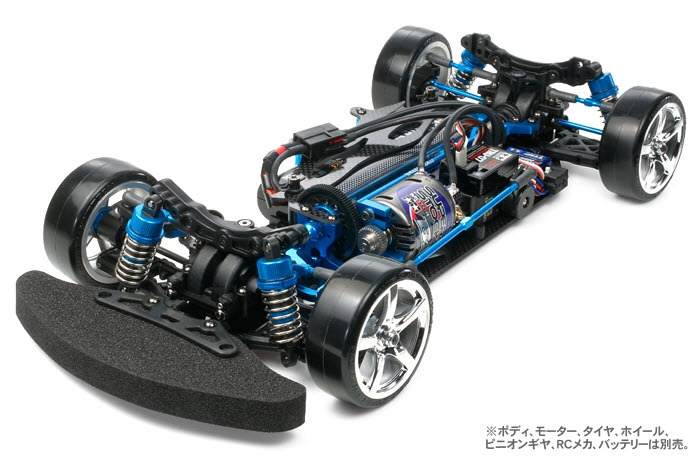 Based on the shaft-driven TB-03 chassis, this drift-spec chassis incorporates a 2.5mm thick carbon lower deck, aluminum gearbox braces to hold front/rear gearboxes, and a distinctive aluminum center brace to provide rigidity toward chassis pitch. The well-balanced layout has the two-piece propeller shaft along the center of the chassis with the battery pack and R/C unit positioned at chassis sides. The chassis also comes equipped with high-spec parts such as knuckle extensions, parallel steering link, and rear direct coupling to offer an exciting drift experience.